Have you ever wondered why the phones aren’t ringing? Why sales are extremely slow, making it increasingly difficult to achieve targets every quarter or at month’s end? Well, there is one proven way to understand the reasons. The key components to powerful marketing communication include having something worthwhile to say, saying it well and saying it often. Most importantly is the medium through which you communicate. 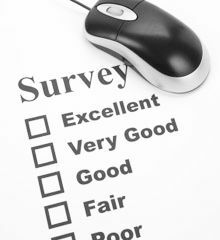 Online surveys are now the best way to communicate with your customers. In any industry, customers represent a wealth of knowledge and experience, and surveys are an ideal way to tap into that knowledge base and build constructive communication. By launching a Customer Survey, you can quickly discover problems, frustrations, even likes and dislikes. When you confidently show customers and prospects that you understand what makes them tick, they are much more likely to want to know more about your company. Show your customers you’re listening and that you care with targeted Customer Surveys. You may even end up with some glowing customer testimonials!